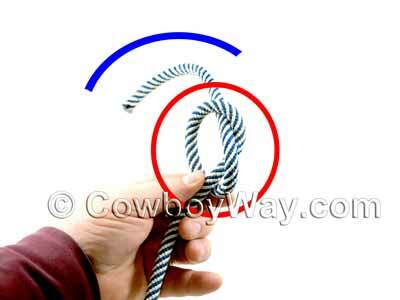 Tying a honda knot in a lasso or lariat type of rope is easier than most people think. Below you will find step-by-step photos of how to tie a honda knot with descriptions accompanying each photo. 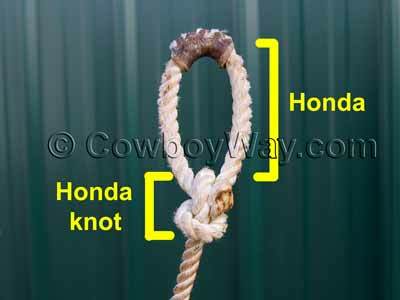 Tying a honda knot is often just called "tying a honda" (without the word "knot"). The information below is for tying a right-handed honda. Left-handed hondas are essentially tied the same way, just in a backwards, or mirror image, way of what you see in the photos below. For the photos, we're using a soft, household-use type of rope. Soft ropes are good for knot-tying practice. Even though the rope is not a lasso or lariat type of rope, the technique is the same. We took the photos from the side so you could see how the honda was being created and tied. However, holding the rope sideways causes some people to accidentally fight the natural twist in the rope and they wind up tying a crooked honda. Try to get into the habit of holding your rope straight out in front of you, and not sideways as in the photos, when tying your hondas. Below: Photo of a finished honda knot. 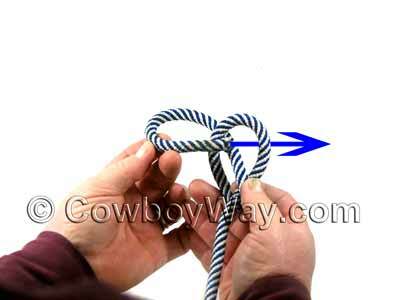 Begin with tying a simple overhand knot. Just take the tail of the rope and follow the arrow below. 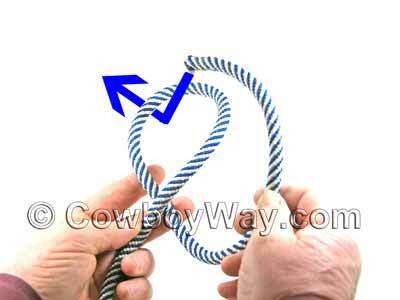 Your overhand knot is complete (it's inside the red circle, below). The blue line in the photo is indicating the part of the rope that will become the loop of the honda. Go ahead and make this part approximately the correct length right now. It should be long enough that when if forms a loop it is about the size you want your honda to be. Push down on your overhead knot where shown. 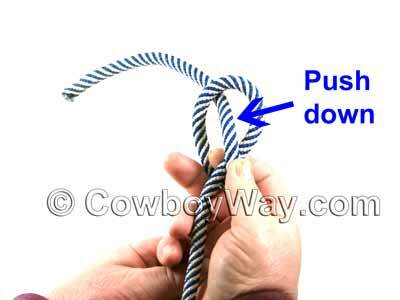 Now take the tail of the rope and push it through the opening made by pushing down on the overhand knot.